Many border stickers remind me of ribbon. However, because they are flat and self-adhesive, you can use them to achieve a look that would be difficult with ribbon. In this layout I have used border stickers to create a unique background for my page. Play around with your border stickers and see what you can come up with. And don't be afraid to cut them! This layout was created using green, blue and purple Bazzil cardstock, alphabet stickers and SRM Press Toddler Time Borders stickers. 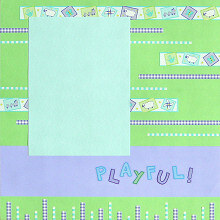 Use the green Bazzil cardstock as the background. Cut a strip of purple Bazzil cardstock approximately 7cm tall. Adhere across your page approximately 3cm from the bottom. Play with the arrangement of your border stickers. Once you are happy with your design, cut them to size and adhere. Please note, for the strips that look like they go behind your photo, you will need to use two smaller pieces (one for the left of your photo and one for the right of the photo) otherwise you will run out of sticker before you have finished your background. Mat a 5x7 photo with blue Bazzil cardstock. If you are using a smaller photo, you might like to first mat your photo with white cardstock and then blue Bazzil cardstock. Adhere towards the top left corner of your page, as shown in the layout above. Cut the remainder of your purple and aqua stickers into small different sized stripes. Arrange along the bottom of your page as shown in the layout above. For the effect above you will need 12 purple pieces and 11 aqua pieces. Space them approximately 0.8cm apart. Finally, use alphabet stickers to add your title along the purple strip. If you wish, you can also add journaling here.